Despite the poor weather forecast and a heavy early morning downpour, skippers enjoyed some unexpected sunshine until during the final race of the day a further torrential downpour caused much discomfort. The wind varied from S to SSW and was at times quite blustery and a number of skippers suffered gear failure as a result. An an early casualty was Dave Andrews (HCMYC) who had to retire from the event after only 3 races because of severe electrical problems. Alan Oxlade (Woodley) and Martin Shaw (HCMYC) also had electrical problems with their boats forcing their retirement, albeit much later during the day's racing. Virtually from the outset it was clear that the event was likely to be a "two horse race" between Peter Wiles (Poole) and Colin Trower (HCMYC). 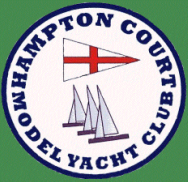 Vernon Appleton (Coalhouse Fort) and Gordon Beddall (HCMYC) battled for third place along with Phillip Wiles (Poole). Despite a late surge by Colin Trower, Peter Wiles emerged as the winner with 18 points closely followed by Colin with 22 points. Vernon Appleton with 50 points narrowly took third place by 1 point from Gordon Beddall. My thanks go to the Race Team of Mike Stroud, Hans Neeser, Graham Gurney, Peter Smith and John Burch whose hard work did much to ensure a successful day's racing.